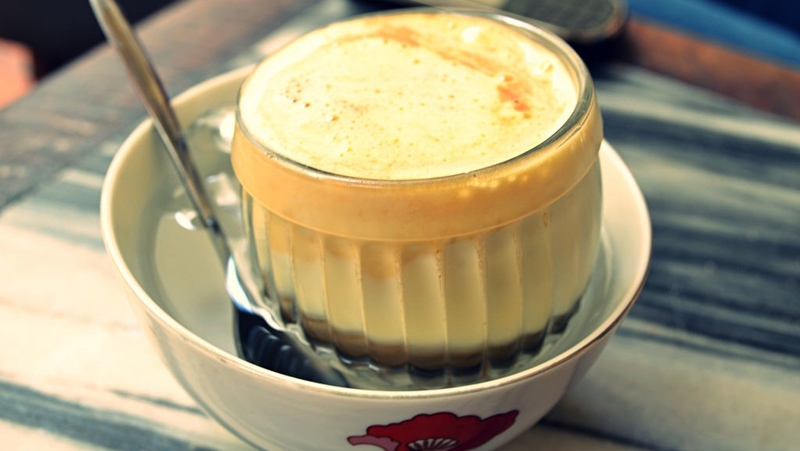 Egg coffee - or 'ca phe trung' - is a blend of coffee and egg whites, folded with sugar, drunk hot or cold. The very first cup of egg coffee was made in early 20th century by Nguyen Van Giang, who used to be a barista at the 5-star Sofitel Legend Metropole hotel. The great-grandfather Giang had turned the western Cappuccino into ‘egg coffee’ made of familiar ingredients and developed the recipe in days when milk was very scarce in Vietnam. That the reason why he used egg yolks to replace milk. Chief ingredients of the drink include chicken egg yolk, Vietnamese coffee powder, sweetened condensed milk, butter and cheese. And then the coffee is brewed in a small cup with a filter before the addition of a well-whisked mixture of the yolk and other ingredients. The cup is placed in a bowl of hot water to keep its temperature. To drink egg coffee, you should slowly stir bobbed froth of whipped egg with the coffee below. Sweet, fat and tasty of egg and milk are in harmony with bitterness of coffee and leaves behind the mesmerizing scent.